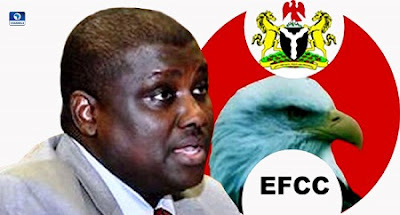 The Economic and Financial Crimes Commission has appealed to Nigerians to help it in locating the whereabouts of Mr AbdulRasheed Maina, former chairman of the Presidential Task Team on Pension Reforms. The anti-graft agency also begged Nigerians to help it arrest the “wanted man.” Spokesperson of the anti-graft agency, Mr Wilson Uwujaren, made the appeal in a phone interview on Channels Television’s Politics Today. The failure of the EFCC to hunt down the former chairman of the Presidential Task Team on Pension Reforms more than a week after he was fired has led many to question the EFCC’s handling of the matter. Those unhappy with the EFCC point to the fact that although Mr Maina had been declared wanted by the commission in 2015, it failed to arrest him when he returned to the country quietly and got reinstated into the civil service; eluding the commission again after his most recent dismissal. But the EFCC spokesperson said the commission had not relented in its quest to arrest Mr Maina and gave the assurance that it was bent on getting him. “We are on his trail; we are not relenting. We have opened up channels of communication and we have linked up with several law enforcement agencies, both internally and outside the country, to ensure that we get him. Wherever he is, he knows that he is a wanted man,” Mr Uwujaren said. To achieve its goal, the commission needs the help of Nigerians, according to him. “I will also use this opportunity to appeal to Nigerians; anywhere, anybody that sees him has a responsibility as a citizen of this country to alert law enforcement agents,” he said.